A trio of Ohio No. 1 results were recorded at Friday's SPIRE Scholastic Meet #1 in Geneva. Adam Beucler led an impressive contingent of Hudson runners, who finished with the top four overall placements. In addition to being first in the state, his 9:27.44 clocking resides at No. 17 nation-wide. The senior indicated that he had completed a work-out just a few days prior and that his training plan calls for him to peak in late February and early March in advance of the Indoor State Championship. Like Beulcer, Morgan Cole also had a state leading performance in the 3200. The Louisville senior led wire to wire and ended up producing a new personal best time of 11:25.83. Making her effort even more impressive is that it came following an average of 50 miles per week that she's been putting in during training and with no speed specific work-outs of late. 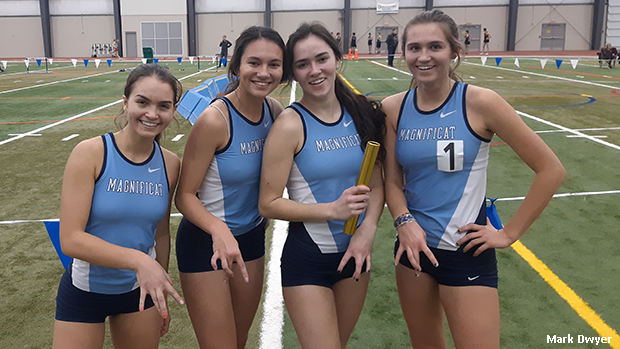 The quartet of Lindsay Bush, Evie Frost, Ella Kuhlman and Erin Prendergast posted the state's top 4x800m result to this point in the season. Their time of 9:56.10 was twenty-two seconds ahead of the runner-up squad from Hudson.